Nestled at the coastal community of Monterey Bay is Munras Inn which offers 29 well appointed rooms. We pride ourselves for having large and spacious guestrooms with fireplaces for a cozy home feel. Each of our guest rooms has its own unique charm, and is beautifully maintained. 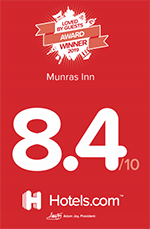 Here at Munras Inn, you'll definitely enjoy great accommodations and excellent customer service. 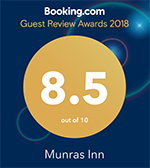 Munras Inn is about a mile away from Old Fisherman's Wharf, less than 3 miles from the famous Monterey Bay Aquarium in Cannery Row, walking distance to most great restaurants in the bay and only a mile from Del Monte Shopping Center.